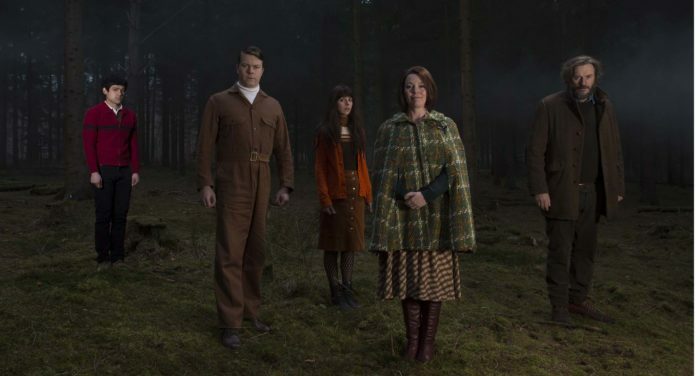 Dark, funny, brave and profound, Flowers is a truly unique piece of depressingly funny TV. When is a comedy not a comedy? When you’re laughing to save yourself from despair. 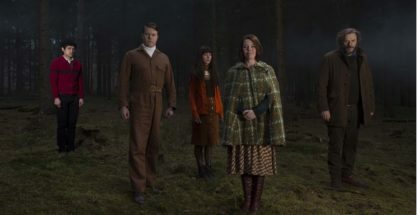 That’s the difficult line walked by Channel 4’s Flowers, a comedy drama that introduces us to the eccentric eponymous family – Maurice, Deborah and the twins – and manages the tricky job of swinging from the funny to the downright morbid, all the while teetering on the brink between profane and profound. The mood is set from the very first frame, which sees Maurice (Julian Barratt) walk up to a tree with a ladder and a noose and try to hang himself – only for the rope to break. Then, to top it off, he discovers that today is his wedding anniversary. No, he hasn’t remembered. And yes, his wife Deborah (Olivia Colman) does want to celebrate. It’s a bleak introduction to the Flowers’ world, but it’s the perfect demonstration of what makes the show so quietly jaw-dropping: it laughs in the face of Maurice’s depression without ever turning it into a joke. And the laughs only keep building the more we see of the people surrounding him. There’s Deborah, who plays the trombone (undoubtedly the funniest of all the brass instruments), there’s Amy (Sophia di Martino), a reclusive goth who plays the piano with a deafening fury, and there’s Donald (Daniel Rigby), a dimwit who fancies himself the next Elon Musk, forever inventing new gadgets, such as a fumigating cheese fondue. 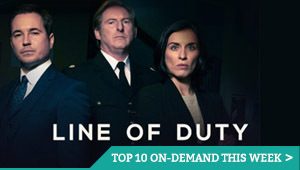 They’re both in love with Abigail (Black Mirror and Broadchurch’s Georgina Campbell), who lives with George (Peep Show’s deliriously loathsome Angus Wright), a posh plastic surgeon with a Donald Trump-esque attitude to parenting. They all converge on the Flowers’ house in the first episode for an anniversary party, one that lays the foundation for what will unfold – a mess of conflicts, misunderstandings and discoveries that range from Maurice being incorrectly accused of showing a child something inappropriate to Amy planning a future nobody else in the family expected. The introduction of their friendly neighbourhood Barry is the icing on the cake. In between them all stands Shun (Will Sharpe), a Japanese migrant who turned up on their doorstep one day and offered to work for them. Why? Because of Maurice’s work: The Grubbs, a series of children’s books that any sane parent would never let anywhere near their kids. Trolls that deal in sadness, loneliness and grief, their world is illustrated by Shun, a picture-book painting of the gloominess that’s harbouring inside Maurice’s mind. Flowers emerges as the live action equivalent of that warped portrait, an exaggerated, colourful and disturbing tale that’s eerily timeless yet strangely pertinent to real life. It’s impossible to overstate just how dark Flowers is, not only visually but tonally. The cast leap into it with a brave commitment, from Sophia di Martino’s upset 20-something to Daniel Rigby’s frustrated, egotistical man, but the central couple are the ones who really shine. Julian Barratt does his best work yet as Maurice, the man of the house who wants to be anything but, a figure of unspoken pain beneath a barely composed surface, his eyes wildly darting one second and blankly staring into the distance the next. His most moving speech occurs when he’s off-screen, but that doesn’t make it any less powerful; Barratt’s voice alone is heartbreakingly vulnerable, as he slowly collapses under the weight of his depression. Olivia Colman is the perfect foil for him, delivering her lines with a hyperactive deadpan that would seem forced in anyone else’s hands – she’s got that nervous laughter all British people have down to a tee, desperately giggling at any small thing to disguise any feelings that could possibly not be happiness. It’s both a symptom and cause of the unhealthy family environment the Flowers have created, one in which Maurice’s sick mum and Deborah’s suspicious sister are just added pressure points to a volcano waiting to erupt. Even Shun, who is played by English-Japanese writer and director Will Sharpe with a manic, over-the-top quality that plays upon stereotypes, is masking a tragic back-story that makes his outsider a perfect fit for this household. The result is a mess of resentment, trauma and mental health issues, and Flowers doesn’t once shy away from the wall of darkness that threatens to engulf everything – it was originally broadcast nightly in a single week, with a double-bill to help people settle into its unusual tone. But what begins as a bizarre comedy of manners emerges as a poignant study of why communication is important, how burying problems without talking only makes them worse, and how loved ones, no matter how messed up they may be, can still provide vital support. And inedible cheese fondue. “It’s like an invisible monster with no shape, no form, but it’s loud and fierce and it never ends,” describes Maurice when he finally opens up. The result is a five-part series that is that rare thing on TV: something truly unique. Not just in its unsettling ensemble comedy and short, sharp presentation, but in its attitude and concerns. It’s dark in a way that’s colourful, rich and bursting with imagination, gloomy in a way that’s provocative and challenging, and, at times, almost hopeful in a way that rings with recognisable truth. Flowers Season 1 is available on Netflix UK, as part of £7.99 monthly subscription. It is also available for free as a box set on All 4. Where can I watch Godzilla (1998) on pay-per-view VOD?